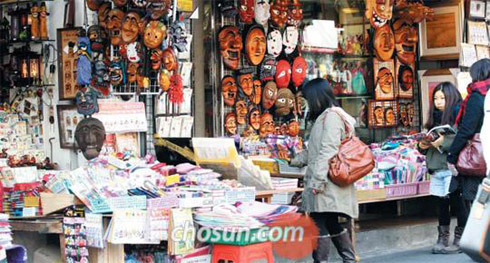 The Seoul Metropolitan Government wants to crack down on the cosmetics stores and Chinese-made tat that are taking over the historical area of Insa-dong and squeezing out traditional businesses. Some 100,000 tourists visit the picturesque area in downtown Seoul every day. The enclave is a symbol of traditional Korean culture contrasting with the gleaming towers of the bustling city. But stores that sell traditional handicraft have been gradually pushed into smaller alleys as the main thoroughfare has been taken over by cosmetics shops. The owner of a traditional tea room said, "After the area was designated a cultural zone, the price of real estate and premiums on leases for store spaces almost doubled. Cosmetics retailers offered appealing prices for leases and premiums, so the landlords told stores selling traditional goods to leave." The number of made-in-China "Korean" handicraft has also grown. A staffer in a shop that sells high-priced handmade crafts said, "Around 50 to 60 percent of the products are made in China." Traders apparently believe that tourists will not know the difference. Visitors shop in Insa-dong, Seoul on Monday. 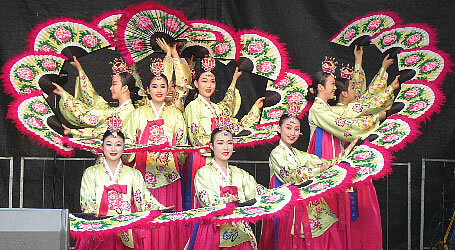 In April 2002, Insa-dong became the first specially designated cultural zone in Korea. That means the Seoul city government can ban businesses that can damage the purpose. Seoul city plans to use this regulation to enact an ordinance prohibiting the sale of low-quality products manufactured overseas. It also plans to include cosmetics stores on the list of businesses prohibited from operating in Insa-dong. Over the last four years, 11 cosmetics stores opened in Insa-dong. Already banned are newly booming businesses such as mobile phone stores and private crammers. But many are skeptical whether the measures will enable Insa-dong to regain its identity. One merchant who has sold traditional handicraft there for over 20 years said, "We may be able to stop cosmetics stores from opening, but it’ll be difficult to stop sales of Chinese-made goods. Vietnamese-made products are even cheaper. Can you stop people from selling them?"